In the picture: Jonathan Thonon (Cunaphoto.it). After a 12 years long collaboration full of International success, the working relationship between CRG and Jonathan Thonon comes to an end. CRG and Jonathan Thonon, works driver of the Italian firm since 2002, decided by common consent to stop their collaboration after a fruitful relationship that was extended to the whole 2013 season. 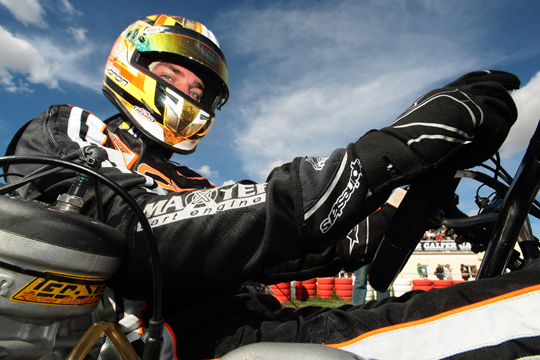 Jonathan Thonon has been wearing CRG colors for all these years as he went on track with team VDK first and then as the main team's works driver. Thonon awarded CRG with a lot of satisfaction including four stunning wins in the KZ1 World Cups of 2007, 2008, 2009 and 2011, the podium in Paris-Bercy in 2001, the victories in the European Championships in 2002 (ICA) and 2008 (KZ1), the win in Las Vegas, the 2010 victories in WSK Euro Series (KZ1) and WSK World Series (KZ2) and in the 2007 WSK International Series (KZ2). In this season, Jonathan Thonon and CRG obtained the fourth place in the KZ European Championship with the podium in Genk and the third place in the KZ1 WSK Euro Series. CRG thanks Jonathan Thonon for the very good relationship with the firm as well as with the racing team and wishes him all the best for his career and the achievement of many more important results.